FlashCoupon has not been designed to present online coupons in a flash. The name of the advertisement-supported program is just a deceitful trick that the developers of the application have employed to fool more computer users. Their goal is to make you trust a completely untrustworthy tool which will only open up security backdoors. If you do not want to take any risks, you need to remove FlashCoupon without any hesitations. The report created with the assistance of malware researchers explains the removal of this adware. Even though FlashCoupon is an unreliable application which is distributed via installerex installers, just like FlexibleShopper, CheapMe, Downpriceapp, and other unreliable adware, this application has a representative website – flashcoupon.info. The purpose of this site is to ensure computer users that the suspicious, often unauthorized, and unreliable application deserves trust. If you do find an unauthorized application running, you should delete it without any questions. You also should scan the operating system to find out what other malware you may need to remove alongside. 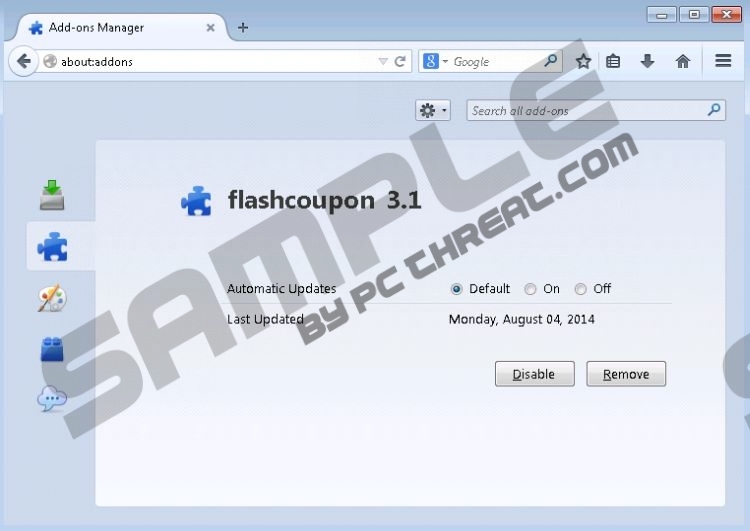 The programs installed together with FlashCoupon may be less or more dangerous and clandestine. In fact, these programs are completely unpredictable, and malware researchers have discovered that tens of different applications may be associated. Nonetheless, it is clear that if you keep these running without researching them or their removal, your virtual security will be extremely vulnerable. Overall, even if FlashCoupon is the only application that requires removal, you could be scammed without even knowing it. If you have done some research on FlashCoupon, you must know that this application has been created to promote pop-up, banner, in-line, interstitial, and other type of advertisements. What is most important is that these advertisements are linked to unreliable third-party advertisers. If you do not delete FlashCoupon right away, this application will flood you with different alluring offers. Make sure you do not click on them, do not purchase the promoted products and, most importantly, do not download the offered freeware. If you do, you may have to delete even more unreliable applications. To circumvent removal, FlashCoupon may be presented using randomized names. Luckily, the developers of the application did not put much effort into their scam, and any user should realize that they need to delete FlashCoupon, even if it is listed as FlashCOupon, FlaoShCoUpon or FlaaashoCooupon. Of course, this scam is mostly developed to trick already active malware removers. We suggest installing up-to-date, authentic malware removal software. This software can save you from the attacks of other threats, which is why you should install it even if you delete FlashCoupon manually. Locate the application you wish to remove and right-click it. Select Uninstall to complete the removal process. Click the Start button on the Task Bar to access a user menu. Now in the menu on the left select Change or Remove Programs. Find the undesirable program, click it once and select Remove. Quick & tested solution for FlashCoupon removal.